New Delhi, January 22, 2016: Rachna Mehra, Theta Healer who can energize people and spin everyone’s world into a new orbit, was recognized among the 100 Women achiever award in the category of ‘Healtcare and wellness’. 100 Women achiever award is an initiative by the Ministry of Women and Child Development in collaboration with Facebook to acknowledge and recognize the contribution of women achievers in India. 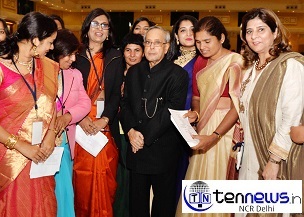 Rachna Mehra along with other women achievers was facilitated by the President, Dr. Pranab Mukherjee, over a lunch today at the Rashtrapti Bhavan. Rachna Mehra is a Soul Catalyst to heal the people from the fatigued and exhausted life due to the jam packed schedule and stress playing havoc. A certificate of science and master instructor from the Theta Healing Institute of knowledge, USA, Rachna Mehra has been practicing theta since 2006. Through her workshops and healing sessions she has worked with over 1000 clients helping them in their journey through her 3E programs, i.e. Education, Experience and Enlightened. Rachna Mehra has been transformational in bringing a change to the lives of many women through her Theta Healing practice. Not only has she empowered women via her teachings, but also has taken 1:1 responsibility to change beliefs and health/ emotional issues.